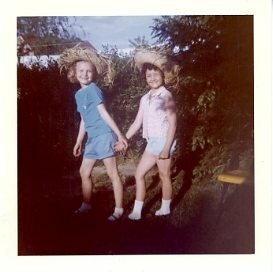 Farmer Deb (on left), maybe age 8? My first experience with germinating seeds was when I was about 5. A neighbor had cleaned out their attic and tossed everything out on their curb for trash pickup. The local rug rats (myself included) thought we’d died and gone to heaven. We went through the entire pile and found loads of treasures. One that I found was an unused kid’s plant growing science experiment kit. It had little clear plastic pots, vermiculite and some radish seeds. When I planted the seeds and they sprouted, I was fascinated with the entire process. Imagine having nothing more than dry dirt and some brown specks and water turn into living, green plants! For years after that I tried to make terrariums in an old 5 gallon fish tank with garden soil and some seeds I’d swiped from our canary’s food dish. When we no longer had Tweety Bird, I would go through our spice cabinet looking for seeds to grow. Actually, I still do that! 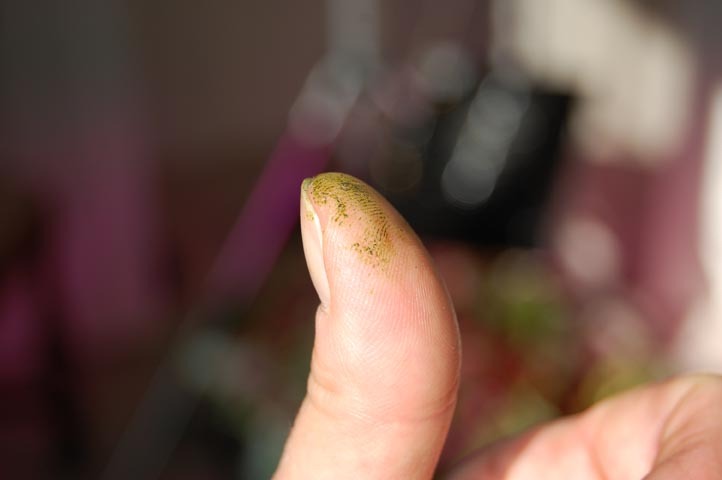 Proof that I have a green thumb! I survive the majority of winter by planning my next garden. Usually after Christmas the seed catalogs start coming in the mail and I’m like a little kid, decades ago, with a new Sears Catalog, closely examining the “enhanced” photos of glorious healthy vegetables at their peak. After a couple of weeks I come to my senses and order only a few packets of things that I know will grow in my garden. Colorado has a very short growing season and so I focus on vegetables that have the shortest growth times from planting to harvest — less than 60 days. I look for the most disease-resistant varieties I can find, without going down that GMO road. Some seeds I don’t even need to buy. If I buy a particularly nice organic winter squash, I’ll save some of the seeds for the garden. I’ve also done this with peppers and tomatoes in the past, but ran into problems with wilt. Most of the time the vegetables I buy in the grocery store have been grown in different areas in the U.S., or otherwise, and may not have resistance to certain organisms found in Colorado. Or maybe they were grown in greenhouses in more sterile conditions. Last year my gorgeous Black Krim tomato plants grown from a Whole Foods tomato purchase succumbed to Fusarium Wilt, just as the tomatoes were growing. It was seriously disappointing. On the other hand, I’ve had really good luck with seeds I saved from a package of Cherub tomatoes. Those little tomatoes are delicious and the plants are incredibly prolific. 1. Vegetables that I use the most get top priority. Once in a while I’ll try something on a whim, like last year’s stevia plant. It did well, I dried the whole thing at the end of the summer, and it’s still sitting in my pantry with the tea. But I know that all year long I use tomatoes in many, many soups and sauces. We love fresh green beans and they are easy to grow and can be prolific. Summer squash is versatile and I use it often. There are a lot more varieties available by seed than in the grocery. I use a lot of Anaheim Chilis for green chili (we char them on the gas grill) and a favorite soup recipe. We love broccoli and use it a lot: steamed, raw, in other dishes. I use broccoli leaves like chard or collards, steamed or sauteed. There are actually a lot more edible veggie plant parts than we are lead to believe! I also grow herbs that I use a lot: basil, parsley, oregano, thyme, rosemary, bay, lemon balm. What I have left over in early fall can be dried or preserved in other ways. I have to say I’ve become fond of keeping just one celery plant in the garden. I don’t use celery all that much, usually a couple of stalks here and there in a recipe and have had store bought celery go bad. A living celery plant all summer is very handy, I just go out and rip off what I need and rest continues to grow. And the flavor of home grown celery, like a lot of other produce, is amazing. 2. 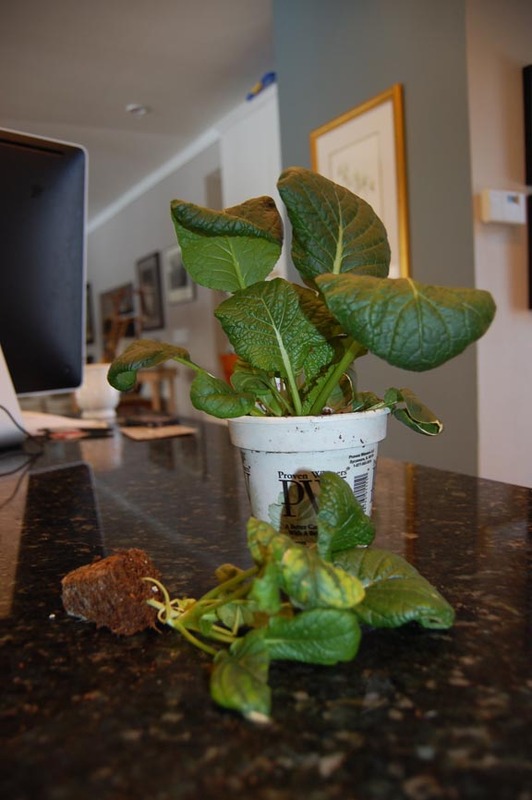 Plants that have a short growing period vie for first priority. With tomatoes and peppers, I start the seeds indoors at the end of February. Other plants are started based on their harvest times, some seeds even get planted directly into the soil. Still working on the timing of those, but they tend to be carrots, lettuce, arugula. I need to pay more attention to Mom Nature and note which plants resulting from reseeding (seeds dropped from the parent plant the previous summer) start up. I’ve had arugula, carrots, tobacco, some flowers, oregano and dill do this. Tomatoes reseed, but too late to produce fruit. They haven’t caught on yet. 3. Plants that are hardy, again very important! Another major consideration. I typically don’t grow things that I know won’t grow here. I also choose resistance to as many diseases as possible without going GMO. 4. Vegetables, fruits and herbs that can be preserved. Whether by freezing (broccoli, summer squash, various peppers and basil in a pesto sauce); canning and/or pickling such as tomatoes, apples, pickled cukes and okra, green beans, grapes; dehydrating such as tomatoes, herbs, garlic; culturing such as cabbage for sauerkraut, carrots, leafy greens, radishes, kohlrabi; or “root cellaring” like green tomatoes, root vegetables and winter squash. Why should you only reap the benefits of an organic garden during the short summer season? Why buy seeds vs. seedlings? My first thoughts are: more variety, monetary savings and the pleasure of growing something yourself. I’ve been starting my own plants for decades, but when early summer hail storms destroy everything I’ve worked towards, I end up replacing my home-grown plants with store-bought ones. On the up side, buying store-bought usually means getting what is hardy for where you live. But, there’s also the lack of variety involved with buying store plants. Yet, if a hail storm has destroyed my garden I’d rather go boring than go nothing at all. If cost is an issue, consider that an entire package of seeds costs less (usually) than buying one commercial seedling. What’s involved with growing from seed? Growing plants from seed is interesting, rewarding and fairly easy. My favorite incubator is one of those plastic trays with a clear plastic lid, 6-cell trays fit inside. It just takes some seed starter mix (make sure you use this, it’s fine and sterile and a happy medium for seeds), some seeds and water. Starter mix should be mixed with water until spongy. Fill the tray cells with the starter, use a pencil to poke some holes in the dirt, toss in 2-3 seeds and cover with a teensy bit of soil. General rule of thumb is bury the seed with soil 2x the size of the seed. Make sure you mark your trays with a Sharpie or tags so you know what you planted. I put my trays on top of the fridge since the temperature is fairly warm and consistent. Seeds do not need light until they sprout through the soil. Some seeds sprout quickly — tomatoes can take just 3-4 days, peppers can take a week or two, carrots take forever. If you’re in a hurry, a heating pad under the tray helps. Check the seeds every day for growth and water needs. The ones that have sprouted need to be removed from the incubator so they can get some light and air circulation. As they outgrow their little cells, you’ll need to transfer them to bigger containers and start introducing your actual garden soil into the mix. Make sure they don’t dry out, and add some plant food here and there. Do you need a grow light? In the past I was able to successfully grow seedlings on window sills, in our sunroom or under fluorescent lights. Last winter I bought myself a full spectrum LED grid light — the choice of marijuana growers here in Colorado. I kept track of the growth of the seedlings throughout the winter and was BLOWN AWAY by the results. The plants grew super healthy and stocky in an amazingly short period of time. 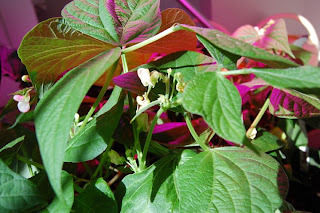 The plants flowered and I actually had little green beans while the plants were in 4″ planters. I am using that same light this year with tomato and pepper seedlings and am again amazed. I have the light on 12 hours a day, on a timer, and my tomatoes and peppers are growing at record rates with NO LEGGINESS at all. Plants that don’t get enough light tend to grow tall and spindly (leggy), searching for the light. on the counter, sunny window grown. These plants are deep green, stocky and very happy. Next winter I’m going to experiment with keeping tomato plants alive and producing throughout the winter with my LED light. Why not collect your own seeds from store-bought produce? As mentioned before, saving seeds from store-bought veggies don’t always work out, as some of those plants are just not meant to be grown in my (or your) climate and may succumb to diseases they are not resistant to. There’s also that question of how long it takes for the produce to grow from planting time. Why deal with those little 6 cell packs? Why not just go for a bigger pot to start off? One year, not long ago, I thought, “why not just put those tomato seeds in a big pot and save myself some work?” Well, the little plants spent all of their energy growing roots to fill all that dirt, and never put any thought into growing their above-ground parts. So, there is a real reason to start small and graduate the planter size. At least in our colder climates where growing season is an issue. Do I need to use seed starter and potting soil for my plants? In the beginning, yes. But to avoid transplant shock when you finally add your plants to the garden, you should have your seedlings in 100% of your garden soil by then. Otherwise you’ll slow down the growth (harvest time) of your veggies. What else do I need to do? The first thing that comes to my mind is don’t forget to “harden off” your seedlings. That means to the weather, the sun and to wind. I’m thinking Colorado again. Seedlings, especially those who have not had a grow light, will be a little spindly. If you put them out in the garden without hardening off, they will be shocked by the night time temps, burned by our relentless sunshine and beat to a pulp by our wind. If your plants are spindly, you need to add a fan to their daily routine. The fan will blow on them and cause them to thicken their stems. To introduce your plants to sun and night temps, you’ll have to put them outside for for increasing amounts of time so they get used to nature. http://www.tomatodirt.com/harden-off.html You can use this info for all of your seedlings. Kind of makes you wonder how plants have survived without human intervention, doesn’t it? Well, the fact is that we, in modern times, grow plants in our climates that otherwise would not have a chance of surviving. In Colorado, unless you have a greenhouse, gardening is still a crap shoot. There are hail storms. Bunnies. Late freezes and snow. Early freezes and snow. Diseases. Unseasonable weather. Technical difficulties. In the 30 years that I’ve lived here, even under the worst circumstances, gardens eventually take care of themselves and produce some degree of satisfaction and sustenance. Growing my plants from seed is very satisfying and really not difficult. And when Mom Nature has other ideas, there’s always Whole Foods. So, happy gardening and never give up! 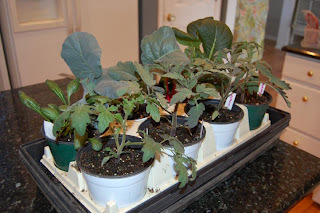 This entry was posted in gardening in colorado, gardening with seeds, germinating seeds, grow lights, how to grow plants from seed, seed starting on March 15, 2013 by Farmer Deb.